California is in the third year of drought, reducing water deliveries and shifting available shifted from lower to higher value crops, which tend to be more labor intensive. Agriculture around Mendota (labor force 4,700 in May 2009) in western Fresno county was more affected by reduced water deliveries than Parlier (6,200) in eastern Fresno county. 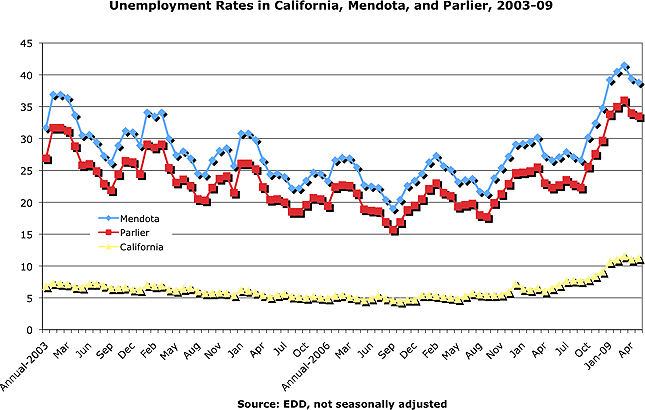 Mendota’s unemployment rate averaged four percent higher than in Parlier between 2003 and 2007, but was five percent higher in 2009, suggesting an extra 50 unemployed workers in Mendota. Local area unemployment rates use 2000 Census data to distribute the unemployed to cities such as Mendota and Parlier.